YOUR SONG 3 wins-2 at 2-to 1400m, A$447,180, BRC BTC Cup, Gr.1, ATC Pluck at Vinery 2YO H., JDC Flooring 2YO H., 2d ATC Run to the Rose H., Gr.3, 3d ATC Roman Consul S., Gr.2, Parramatta Leagues Club H.. He entered stud in Aust. in 2013. Sire of 152 progeny to race, 92 winners (60.0%), earnings of over $6.9 million, 3 stakes winners, 5 stakes placegetters, inc.
GEM SONG (15c, Peintre Celebre, Yeats). 4 wins-2 at 2-to 1300m to 2018-19, A$315,845, ATC Eskimo Prince S., Gr.3, TAB Rewards 2YO H., Cabra-Vale Diggers H., Pride of Dubai at Coolmore 2YO P., 2d ATC Dulcify H., L, 3d ATC Australian Turf Club H., 4th ATC South Pacific Classic, L.
BRAVE SONG (14g, Dr Fong, Zephyr Zip). 5 wins-1 at 2-to 1250m to 2018-19, A$373,870, MRC Village S., L, VRC TAB/ATA Trainers’ Trust H., ATC Theraces H., Turf Club H., Ascot Restaurant 2YO H., 2d ATC Hall Mark S., Gr.3, TAB 2YO H., 3d VRC Aurie's Star H., Gr.3, ATC Eskimo Prince S., Gr.3, MRC Regal Roller S., L, 4th MRC Testa Rossa S., L.
SPLIT LIP (14f, Blevic, Mustin Lake). 3 wins-2 at 2-to 1100m to 2017-18, A$260,130, SAJC Dequetteville S., L, Bradley Painting H., James Boag's Premium 2YO P., 2d SAJC Proud Miss S., Gr.3, VRC Cap d'Antibes S., L, Geelong RC Shojun Concrete S., L, 3d SAJC Adelaide Festival of Racing H., Projection Graphics 2YO P., Gawler & Barossa JC Sanders Fodder 2YO P., 4th MVRC Champagne S., Gr.3, MRC Thoroughbred Club S., Gr.3. Memento (14f, Success Express, Haulpak). 2 wins at 1100m, 1200m to 2018-19, A$101,475, ATC Tab.com.au H., MRC Clanbrooke Racing H., 2d ATC So You Think at Coolmore 2YO H., Hyland Race Colours 2YO P., 3d ATC Magic Night S., Gr.3. The Tenor (15g, General Nediym, Reprimand). 2 wins-1 at 2-at 900m, 1000m to 2018-19, A$76,420, 3d ATC Brian Crowley S., L, Rosebud Prelude 2YO H.
Ceol Na Mara (15f, Luskin Star, Vain). 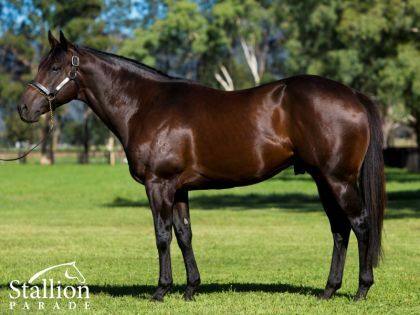 2 wins at 1200m, 1650m in 2018-19, A$102,920, Qld Tatt's RC Eagle Way Stayers H., 2d BRC Meagher Racing Eagle Way H., 3d SCTC Princess S., L.
Soundcheck (14g, Real Jester, Magic of Money). 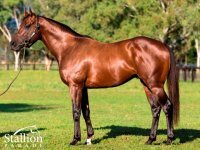 Winner at 1000m in 2017-18, WATC Wireline Services Group H., 3d WATC Supremacy S., L, Kalgoorlie-Boulder 125yrs H., 4th WATC Perth S., L.
Peristrophe (14f, General Nediym, Picnicker). Placed at 2, 2d TTC Gold Sovereign S., L.
Tabbing (14g, Exceed and Excel, Kris S). 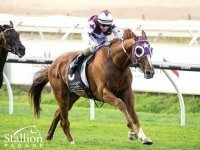 5 wins-2 at 2-at 1050m, 1200m to 2017-18, A$224,225, SAJC Schweppes Oaks 6th May 2YO H., Hughes Limousines 2YO H., Qld Tatt's RC Stella Artois H., Ipswich TC QT H., Ray White H., 2d SAJC SA Derby Raceday 2YO H., BRC Sky Thoroughbred Central H., SAJC Goldin Farms H., 3d SAJC Schweppes 2YO P., BRC Ray White Ascot P., TAB H., SAJC Alex and Ben's 50th H., Ubet H., GCTC Storm Creek Racing H., 4th SAJC Queen Adelaide S., L.
Bold Kingston (14g, Distant Music, Danehill). 5 wins-3 at 2-to 1500m to 2018-19, A$114,300, BRC Doomben Cup Raceday 2YO H., Rockhampton JC Breeders 2YO P., 2d Qld Tatt's RC Southbank Insurance Brokers 2YO H., 3d BRC Jim Beam 2YO H., Rockhampton JC USG Boral 2YO H.
Mister Songman (14g, Weasel Clause, Orient Way). 5 wins to 1400m to 2018-19, A$177,300, TTC Hesketh McCrimmon Cup, Armidale Stud 3YO Trophy, ATC Vale John Marshall H., TTC Nextra Kings Meadows H., Rotary of Cent Launceston P., 2d TTC PFD Food Services Classic H., ATC Happy 21st Madeleine H., 3d TRC Tony Carrick Vase H., ATC Summer Racing H.
Miss Exfactor (14f, Quest for Fame, Papal Power). 4 wins-1 at 2-to 1200m to 2017-18, A$176,200, GCTC Couldn't You Go a Vilis H., SCTC Ubet H., GCTC Haymans H., A&T Trading 2YO H., 2d BRC Broncos Superstore H., Qld Tatt's RC Winning Edge Presentations 2YO H., 3d BRC Chu the Phat H., Ipswich TC CNE Concrete Pumping H.
Hold the Line (15f, More Than Ready, Top Account). 3 wins at 1200m in 2018-19, A$192,000, SCTC Beach Houses Holiday H., James Ackerman Memorial H., Ipswich TC United Sports Club P., 2d BRC Robert John Wallis P.
Setoga (14g, Comet Shine, Archregent). 3 wins to 1200m in 2017-18, A$83,200, BRC Fat Noodle Yum Cha Menu H., GCTC Jim Beam H., SCTC Sky Thoroughbred Central P., 3d BRC Weddings H.
Envy of All (14f, Giant's Causeway, Thunder Gulch). 3 wins-1 at 2-at 1100m to 2017-18, A$221,130, Ipswich TC Schweppes TL Cooney H., ATC Randwick Mayor's Cup H., Casino Prince at Vinery 2YO H., 2d ATC Fresh for Kids 2YO H., SCTC Ubet H., ATC Theraces 2YO H., 3d ATC Tab.com.au 2YO H., TAB Rewards H., 4th Scone RC Denise's Joy S., L.
Only Wanna Sing (15g, Beat Hollow, Jaazeiro). 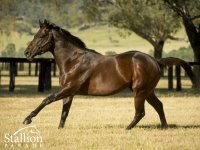 Winner at 2 in 2017-18, A$89,360, BRC Treasury Member Meal 2YO H., 2d Qld Tatt's RC Winning Edge Presentations 2YO H., BRC Padua Old Boys 2YO H., 4th BRC Dalrello S., L.
Girl in a Million (14f, Zeditave, Rubiton). 5 wins-1 at 2-to 1050m to 2018-19, A$99,160, BRC JLL Australia H., 2d BRC EDB Training Services H., SCTC Yaroomba Beach H.
It's Got it All (14g, Haradasun, Naturalism). 4 wins at 950m, 1000m to 2018-19, WATC PSC Insurance H., Penfolds H., 3d Singapore TC Class 3 H.
Music Addition (14g, Elusive Quality, Citidancer). 4 wins-1 at 2-to 1200m to 2018-19, HKJC Blue Pool H., So Kon Po H., 2d HKJC Panasonic Beauty Device H.
Intothelimelight (14f, Anabaa, Will Dancer). 3 wins from 1400m to 2000m to 2018-19, R244,250, Kenilworth ICA Laboratories H., 2d Durbanville Tab Telebet H., Kenilworth Supabets H., 3d Kenilworth Supabets H.-twice. Cedarwood (14g, King's Theatre, Key to the Mint). 3 wins from 1200m to 1650m to 2018-19, A$129,365, Ipswich TC Get Social at Ipswichturfclub H., 2d ATC Tab.com.au H., Ribchester New to Darley H., Qld Tatt's RC Lazy Yak H., BRC Kelly Lawyers H., 3d BRC Moet & Chandon Chairman's H., Rawgroup P.
Poetic Charmer (14g, General Nediym, Favorite Trick). 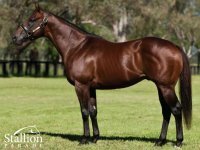 3 wins at 1200m, 1400m to 2018-19, A$168,615, ATC Australian Turf Club H., TAB H., 2d ATC Aviary at Randwick H., Eric 'Mo' Conlon H., HQ of Insurance H., Pluck at Vinery P., Schweppes P.
Golden Halo (15f, Faltaat, Defensive Play). 2 wins-1 at 2-at 1000m, 1100m to 2018-19, SAJC Ubet H., 2d MRC Mypunter.com H., 4th MVRC Scarborough S., Gr.3. Nautic Spirit (14f, Chateau Istana, Tolomeo). 2 wins at 1200m in 2017-18, R230,713, Vaal Interbet.co.za H., 2d Vaal Play Soccer H., Betting World Assessment P., 3d Turffontein All to Come H., Vaal Tab Telebet H.
Remigny (14f, Faltaat, Defensive Play). 2 wins at 1100m, 1200m to 2018-19, TRC Silk Laser Clinics H., TTC Invermay Newsagency P., 2d TRC Trchobart.com.au H., Crown Lager Bar H.
Hollaback Girl (15f, Not a Single Doubt, Lake Coniston). Winner at 1050m in 2018-19, BRC ETU H.
Craig's Star (15g, Blevic, Mustin Lake). Winner at 1400m in 2018-19, HKJC BMW Centenary H., 2d HKJC Plantation H., Tung Wah Group of Hospital H., Journalist Challenge Cup H.
Thou Shall Sing (14g, St Covet, Cure the Blues). Winner at 1000m in 2018-19, HKJC Jupiter H., 2d HKJC Nam Kok H., Carnation H., 3d HKJC Kwoon Chung Zhuhai Express H., Plover Cove H.
French Tune (14c, Faltaat, Volksraad). Winner at 1100m in 2017-18, ATC Pluck at Vinery P.
Soxey (14f, Carnegie, Kaapstad). Winner at 1100m in 2017-18, Ipswich TC Schweppes H., 2d GCTC Energy Super H.
FASTNET ROCK (AUS) (Bay 2001-Stud 2005). 6 wins to 1200m, VRC Lightning S., Gr.1. Champion Aust. Sire twice. Sire of 1646 rnrs, 1163 wnrs, 145 SW, inc. Atlantic Jewel (MRC Thousand Guineas, Gr.1), Shoals, Sea Siren, Fascinating Rock, Zhukova, First Seal, Avantage, Laganore, Planet Rock, Age of Fire, Mosheen, Merchant Navy, Driefontein, Comin' Through, Catchy, Amicus, One Master, Unforgotten, Heroic Valour, Awesome Rock, Atlante, Super Cool, etc. YOUR SONG (c by Fastnet Rock) 3 wins. See below. Chairman's Vote (g by Street Sense (USA)) 6 wins to 1350m to 2017-18 in Aust. and Macau, 2d ATC Testa Rossa at Vinery P.
Wimbledon (c Snitzel) 7 wins to 1200m, S$701,876, Singapore TC Kranji A S.-twice, Novice P., Singapore Airlines Airbus 330 S., Kranji C S., Class 4 H., 2d Singapore TC Garden City Trophy, L, Kranji Sprint, L, Paititi Gold Trophy, L, Landex Cup, Kranji A S., Hong Kong Jockey Club Trophy, Kranji D S., Novice P., Class 4 H., 3d Singapore TC Merlion Trophy, L, Garden City Trophy, L, Korea Racing Authority Trophy, Better Than Ever S., Hong Kong Jockey Club Trophy, Benchmark 97 H., 2YO Open H., 4th CECF Singapore Prestige Classic, L.
E Master. 3 wins at 1000m, 1200m, HK$2,309,800, to 2018-19, HKJC Nam Fung H., Tsui Man H., Yan Chai 50th Anniversary H., 2d HKJC Tak Wah H., Jedburgh H., 3d HKJC Kowloon Bay H.
Street Don. 9 wins at 1200m, 1300m in Philippines. Mercy's Choice. Winner at 1100m in Aust. 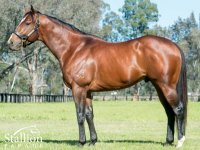 Nais Ko (f by Exceed and Excel) Winner at 1250m in 2017-18 in Aust. Carnelian. 5 wins at 1600m, 1700m to 2019, Singapore TC Kranji D S., Kranji S., Class 4 H., Class 5 H., 2d Singapore TC Class 4 H., 3d Singapore TC Speedy Cat S., Class 5 H.-twice. Ikara Miss. 2 wins at 1350m, 1600m in 2018-19 in Aust. ANEES (c Harlan's Holiday) 4 wins-3 at 2-at 1200m, 1400m in Argentina, San Isidro Clasico Manuel Anasagasti, L, Clasico Antartida Argentina, L, Clasico Vilmar Sanguinetti, 4th San Isidro G.P. Dos Mil Guineas, Gr.1. Shaiboob. 2 wins-1 at 2-at 1200m, 1400m in Argentina, Palermo Especial Deleite. FANTASTIC LIGHT (c Rahy) Horse of the Year & Champion Older Horse in Europe in 2001. Champion Turf Male USA in 2001. 12 wins-2 at 2-from 7f to 1½m, £1,226,902, US$2,507,400, HK$8,000,000, 63,498,000¥, 4,792,000Dhs in GB, Ireland, U.S.A., HK and U.A.E, Leopardstown Irish Champion S., Gr.1, Breeders' Cup Turf, Gr.1, Hong Kong Cup, Gr.1, Belmont Man o' War S., Gr.1, Royal Ascot Prince of Wales's S., Gr.1, Curragh Tattersalls Gold Cup, Gr.1, York Great Voltigeur S., Gr.2, Sandown Classic Trial S., Gr.3, Nad al Sheba Dubai Sheema Classic S., Gr.3, Newbury Arc Trial, L, 2d Ascot King George VI & Queen Elizabeth Diamond S., Gr.1-twice, Epsom Coronation Cup, Gr.1, Royal Ascot Prince of Wales's S., Gr.2, Nad al Sheba Dubai Sheema Classic, Gr.2, 3d Japan Cup, Gr.1, Sandown Eclipse S., Gr.1, Goodwood Stardom S., L. Sire. HI DUBAI (f Rahy) Winner at 1¼m, Newmarket Pretty Polly S., L, 2d Longchamp Prix Saint-Alary, Gr.1, Newmarket 2YO S., 3d Woodbine EP Taylor S., Gr.1, 4th Goodwood Nassau S., Gr.1. Producer. Hawsa (f Rahy) 3 wins from 2100m to 2250m, Craon Prix du Chene de Craon, 2d Angers Grand Prix d'Angers, 3d Hannover Grosser Preis der AWD Holding AG, L. Producer. Dawn Delivers (f Dawn Approach) Winner at 2, Curragh Irish Stallion Farms 2YO Fillies S., 3d Leopardstown Silver Flash S., Gr.3, 4th Curragh Ballyogan S., Gr.3, Naas Athasi S., Gr.3. Mu'ajiza (f Pivotal) 2 wins at 7½f, 8¼f, 2d Ascot Lawyers Fillies' S., 3d Pontefract Flying Fillies' S., L.
TARQUIN (g Hard Spun) 6 wins-2 at 2-from 1200m to 2000m, A$694,210, to 2018-19, ATC Pago Pago S., Gr.2, VRC Living Legend REM Mallyon H., MRC Ladbrokes H., Mornington Guineas, MRC Next Payments H., 2d Mornington Cup, L, VRC Club Stand H., ATC Clubsnsw 3YO P., 3d ATC Champagne S., Gr.1, MVRC JRA Cup, Gr.3, 4th Mornington Cup Prelude, L.
Won BRC BTC Cup, Gr 1 (1200m), ATC Pluck at Vinery 2YO H. (1400m), JDC Flooring 2YO H. (1300m), 2nd ATC Run to the Rose H., Gr 3, 3rd ATC Roman Consul S., Gr 2, Parramatta Leagues Club H.
FASTNET ROCK Champion 3YO colt & sprinter in Australia in 2005. 6 wins to 1200m, A$1,724,100, VRC Lightning S., Gr.1, MRC Oakleigh P., Gr.1, VRC Lexus Classic S., Gr.2, AJC Up & Coming S., Gr.2, VRC Rory's Jester P., Gr.3, NSW Tatt's RC Roman Consul S., Gr.3, 2d AJC TJ Smith S., Gr.1, VRC Newmarket H., Gr.1, AJC San Domenico S., Gr.2, STC Pago Pago S., Gr.2, MRC Guineas Prelude, Gr.3, STC Skyline S., Gr.3, Crusoe's Fijian Retreat 2YO H., 3d AJC Sires' Produce S., Gr.1, VRC Poseidon S., L, 4th STC Golden Slipper S., Gr.1, Silver Slipper S., Gr.2. He entered stud in Aust. in 2005. Champion Aust. Sire in 2011-12, 2014-15, second in 2012-13, third in 2016-17 & 2017-18. Leading Aust. Sire (worldwide earnings) in 2011-12, 2014-15, 2016-17. Leading Aust. Sire of 3YOs in 2011-12, 2014-15. Leading NZ Sire of 2YOs in 2017-18. Champion Sire in Hong Kong in 2016-17. 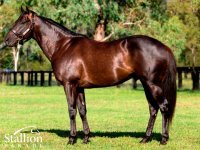 Sire of 1647 progeny to race, 1163 winners (70.0%), earnings of over $173 million, 145 stakes winners, 115 stakes placegetters, inc.
Australia’s Leading First Season by Winners & Stakes Performers. 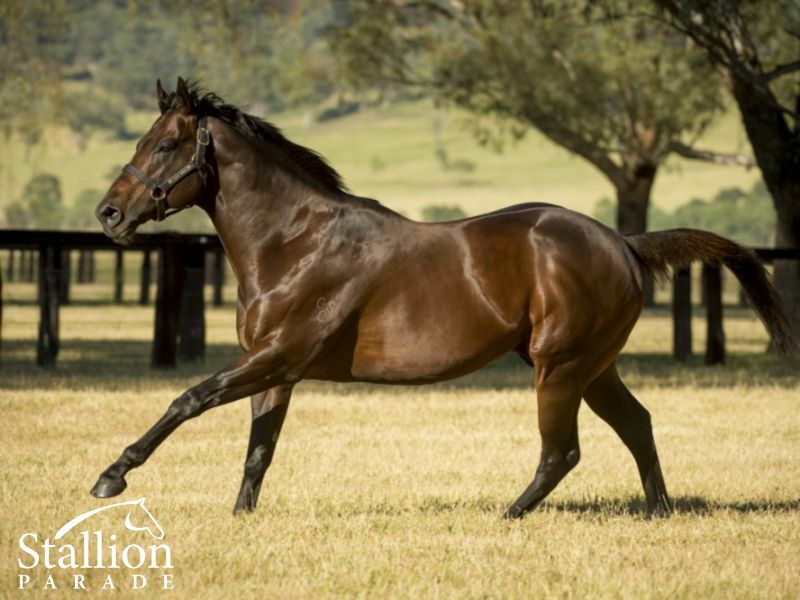 Produced the best start, statistically, than any other sire-son of Fastnet Rock. Ever. Sire of impressive Stakes Winner SPLIT LIP amongst four first crop 2yo stakes performers to date. Without peer – A truly magnificent individual who has genuinely stamped his stock. 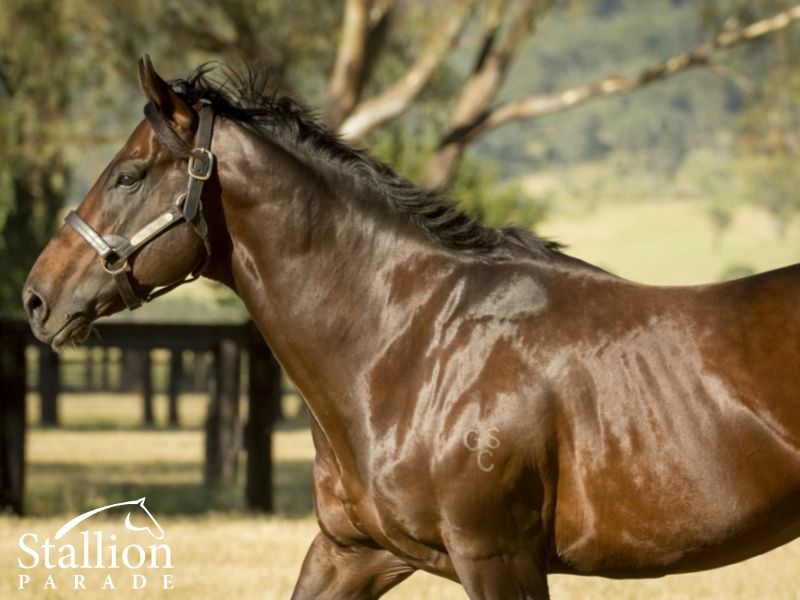 The most dominant Group One winning son of FASTNET ROCK, sire of 27 individual Gr 1 winners.